Large area, fully automated, programmable standalone system with coordinated XYZ motion control using Windows-based software and user-friendly teach pendant with trackball. 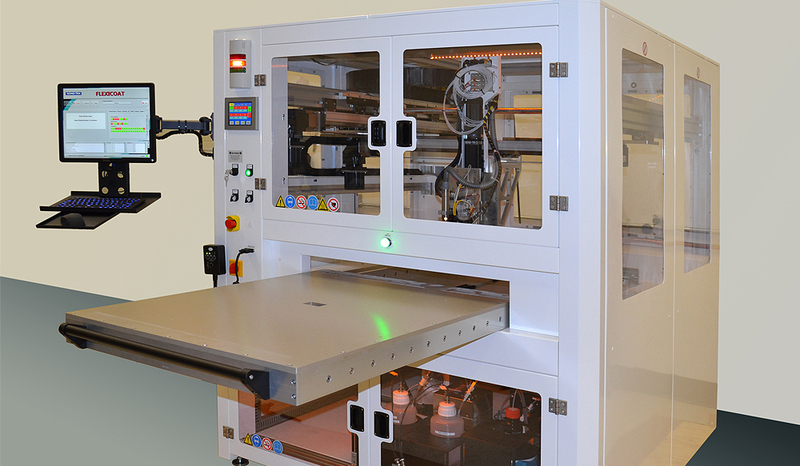 Versatile mid to high-volume or pilot scale production thin film coatings. Sono-Tek’s fuel cell catalyst coating systems are uniquely suited for these challenging applications by creating highly uniform, repeatable, and durable coatings. 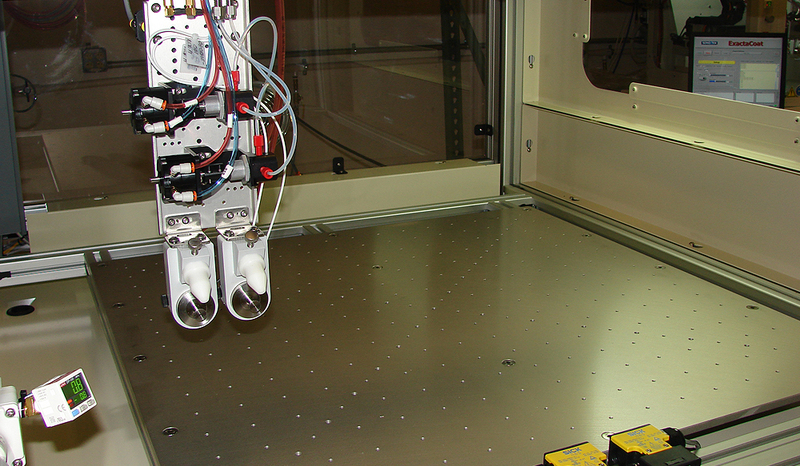 From R&D to production, our non-clogging technology results in greater control of coating attributes, significant reduction in materials usage, and reduced maintenance and downtime. 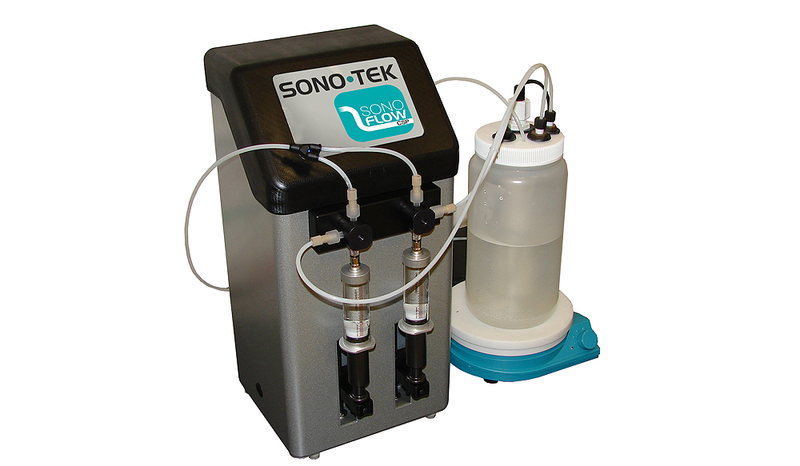 Sono-Tek ultrasonic coating systems produce highly durable, uniform, coatings of carbon-based catalyst inks onto both fuel cell and electrolysis processes for proton exchange membrane (PEM) electrolyzers such as Nafion, without deformation of the membrane. 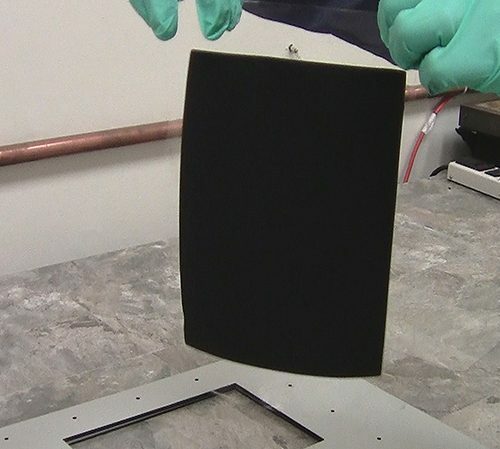 Uniform catalyst coatings are deposited onto PEM fuel cells, GDLs, electrodes, various electrolyte membranes, and solid oxide fuel cells with suspensions containing carbon black inks, PTFE binder, ceramic slurries, platinum and other precious metals. Other metal alloys, including Platinum, Nickel, Ir, and Ru-based fuel cell catalyst coatings of metal oxide suspensions can be sprayed using ultrasonics for manufacturing PEM fuel cells, polymer electrolyte membrane (PEM) electrolyzer, DMFCs (Direct Methanol Fuel Cells) and SOFCs (Solid Oxide Fuel Cells) to create maximum load and high cell efficiency. 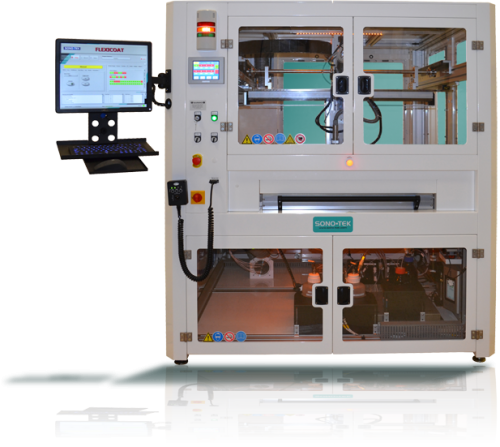 Sono-Tek ultrasonic nozzles are used by some of the largest fuel cell manufacturers in the world for spraying uniform thin film layers of catalyst inks. 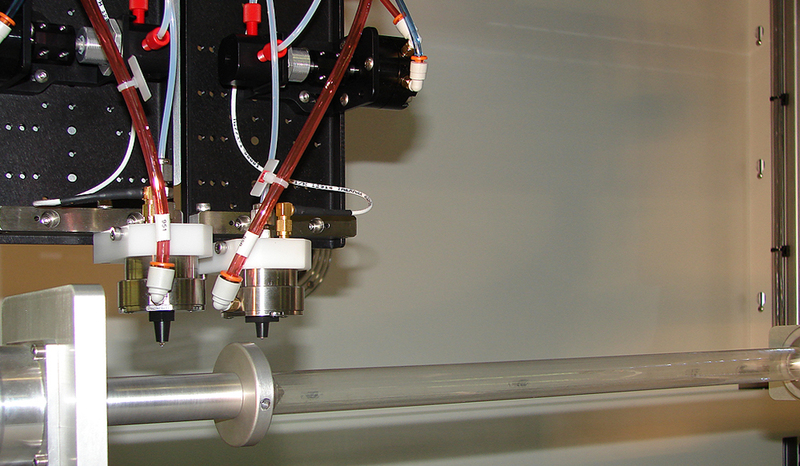 Research has proven Platinum utilization in membranes coated using ultrasonic spray is approximately 90%. For more information regarding research papers on this topic please use the Request Technical Papers link on the right. Catalyst solutions will not clog the ultrasonic nozzle, allowing for uniform, homogeneous fuel cell catalyst coatings with controlled droplet sizes from ultra-low flow to production scale flow rates. In addition, Sono-Tek ultrasonic nozzles are well suited to spraying polymer solutions such as PTFE binder onto GDLs to enhance hydrophilic or hydrophobic properties in electrolyzing processes. Very high Platinum utilization proven in MEA fabrication; as high as 90%. Highly porous coatings are extremely durable, preventing cracking or peeling of catalyst layer. Up to 50% reduction in material consumption with reduced overspray, conserving expensive catalyst inks. 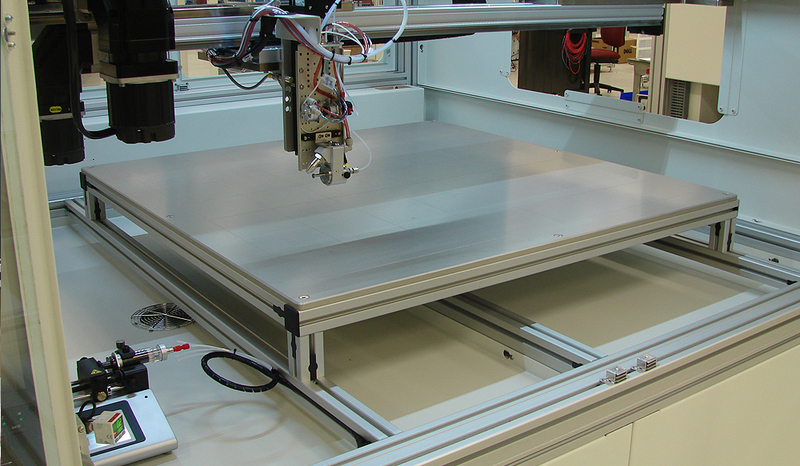 Clean, precise spray patterns that are easily shaped for various applications. Highly controllable spray that produces reliable, consistent results. Non-clogging atomized spray that does not deviate. Ultra-low flow rate capabilities, intermittent or continuous. Ultrasonic vibrations continuously break up agglomerated particles and keep them evenly dispersed; maximizing platinum utilization. 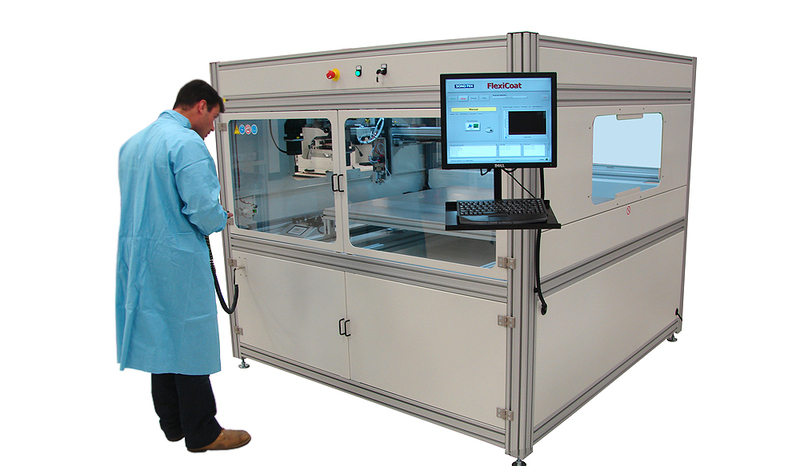 Capable of coating PEMs with very small liquid sample sizes (only 10ml of catalyst solution necessary to coat multiple PEMs). Ideal for R&D phase. Excellent stiction “adherence” to PEM; optimal for high vibration fuel cell applications such as automotive parts. Sono-Tek ultrasonic nozzles break apart agglomerated particles as they travel down the nozzle body due to continuous ultrasonic vibrations along the length of the nozzle, resulting in the most effective use of functional particles. Breaking up agglomerates into evenly dispersed catalyst layers using ultrasonic spray results in higher electrochemical performance and greater repeatability of functional coatings.